We are back from a brief hiatus and are snowed with a desk full of projects. But as your weekend is approaching, and football is so far less than exemplary (at Least in Tucson), we thought a few construction photos might help pass the time. We’ll start with FPB64-6, above, now well along in its metal phase. From the aft deck, looking forward. The fuel tanks are located amidships, under the basement, and are heavily baffled. Just the longitudinal girders are shown here. The transverse “floors” will come next. 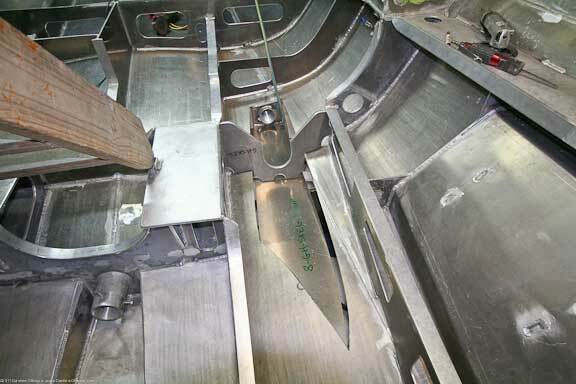 Jumping to FPB64-5, we are looking at the main prop shaft housing and skeg (right in the photo) and the framing for the get home prop skeg. 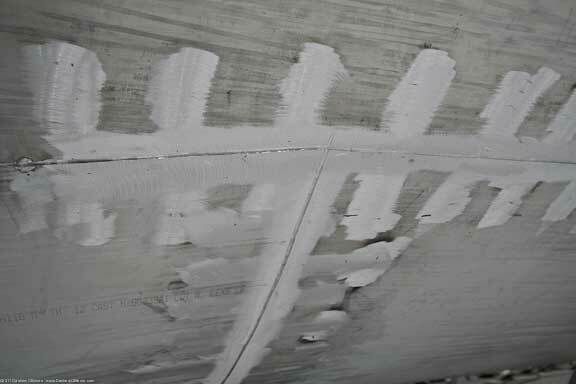 Odds are if something damages the main prop it will wipe out any auxiliary propeller that is not well protected. A simple P-bracket would be easier than this massive full skeg, but the vulnerability of this approach leaves us uneasy. The side plates for the smaller skeg, pre-marked with bending points to help with shaping. And a look in the engine room at the prop shaft penetrations. Main engine to the left, get home further back in the center of the photo (port side of the hull). The rudder shaft with welded framework for upper two thirds of the fin. The hull to deck intersection has a massive rub rail extrusion to protect it and distribute piling (or collision) loads. 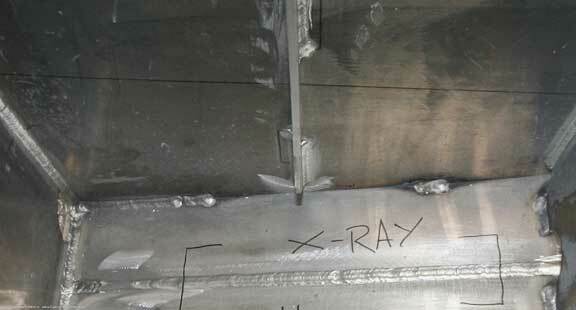 The pipes will become stanchion bases and are welded top and bottom through this extrusion. 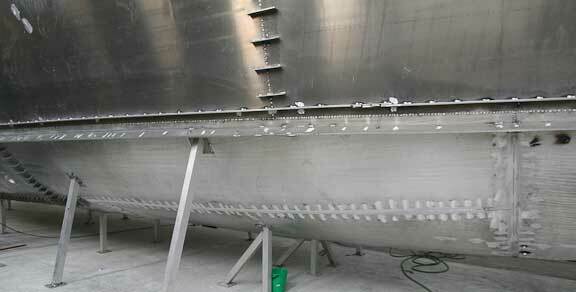 The fully welded hull ready for grinding. 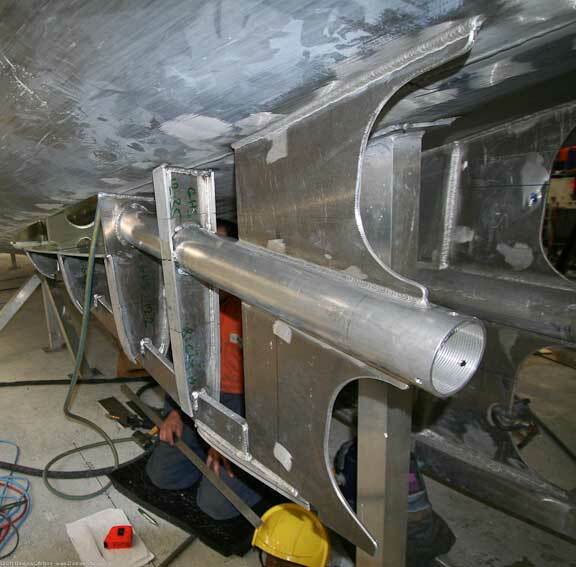 Welds below the waterline are left proud (above the surface). 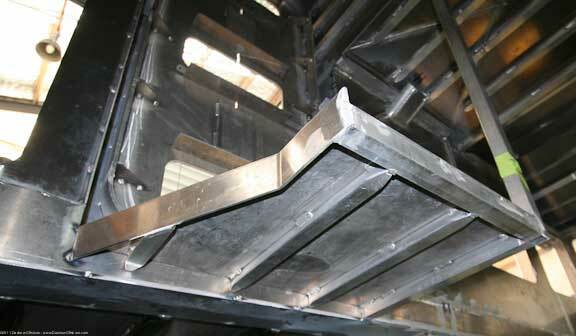 Welds on the topsides are ground fair. 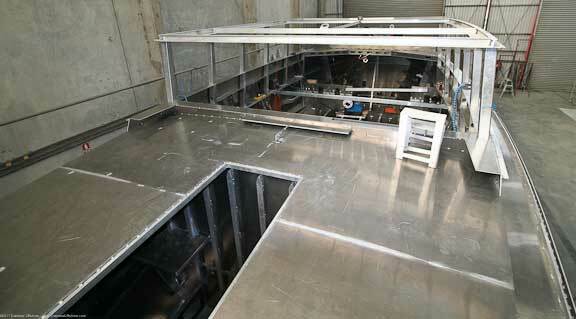 This is the inside of one of the tanks, where an X ray will be taken of the hull plate weld. 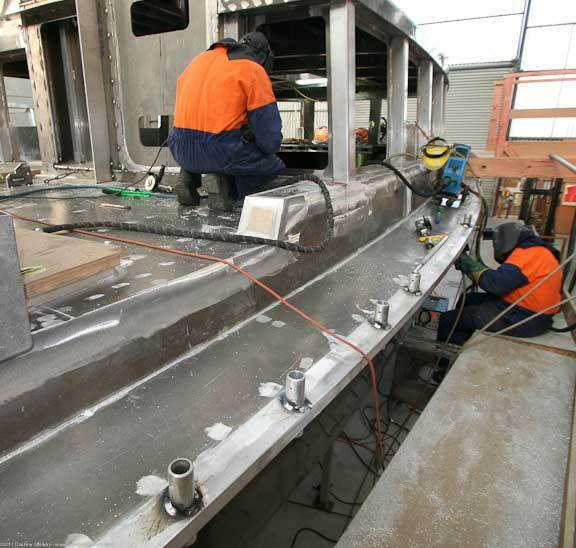 Still on FPB64-5, the framework in the foreground, welded square tubing, will form the floor support for the great room. This is the main entry door, with the landing base cantilevered from the frame that forms the aft end of the house. 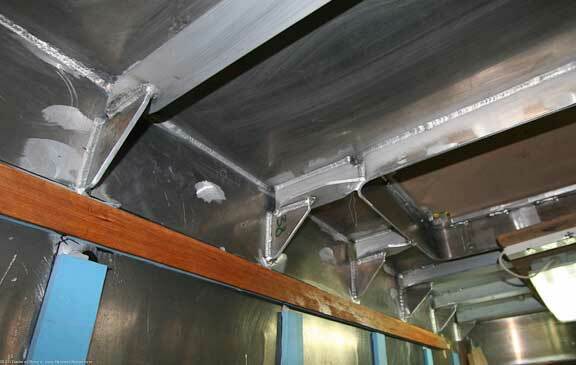 One of the reasons these boats are so quiet, and don’t work (move) at sea, is their welded construction. 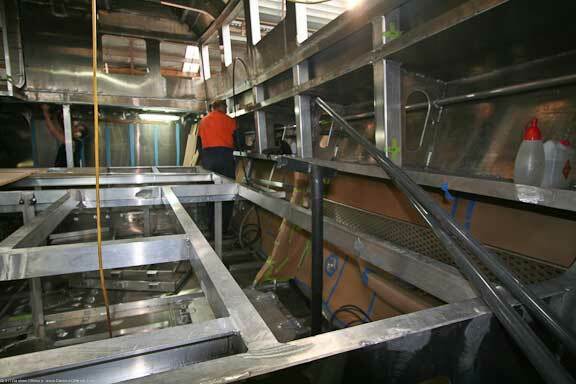 Furniture and bulkheads stay in place, and there are no squeaks or rattles from bulkheads and cabinets changing shape as the hull loading varies with wave impact. Speaking of which, note the gussets at the deck to bulkhead connection. 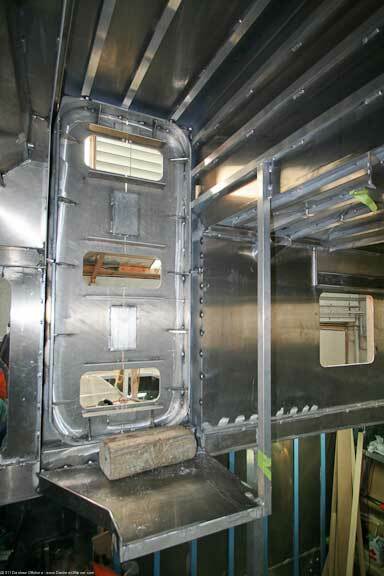 The blue material is a soft isolator that will keep the plywood facing of the engine room bulkhead from amplifying and broadcasting engine room noise. 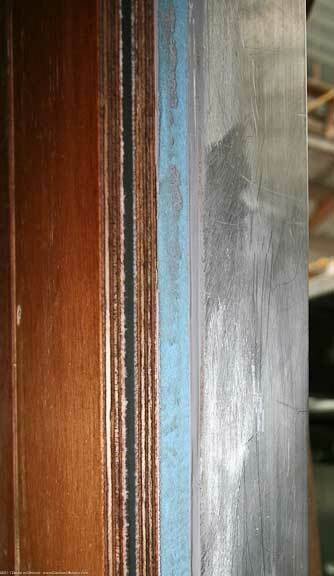 The bulkhead plywood has a rubber decoupling layer as further insurance towards a quiet boat at sea. 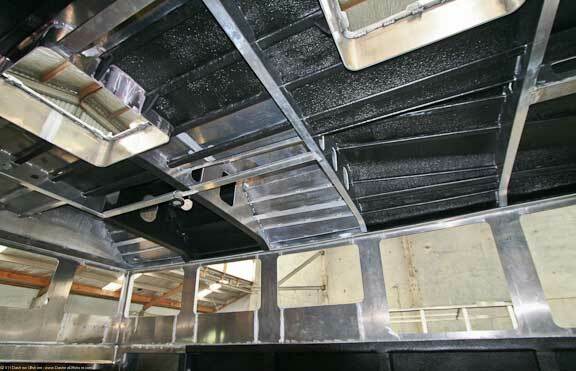 Then there is the Armaflex insulation/sound attenuator which covers tank tops in the sleeping areas, hull sides, deck, and framing. 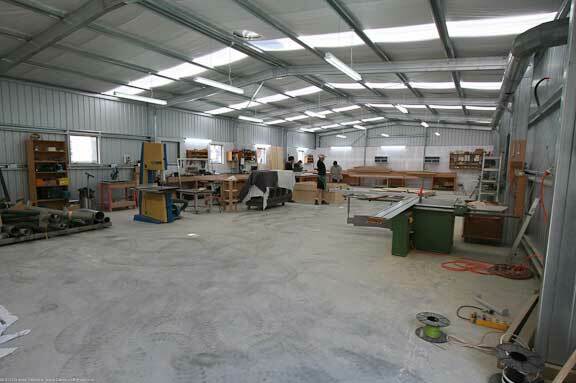 Circa have built a new, larger facility, for the cabinet shop. 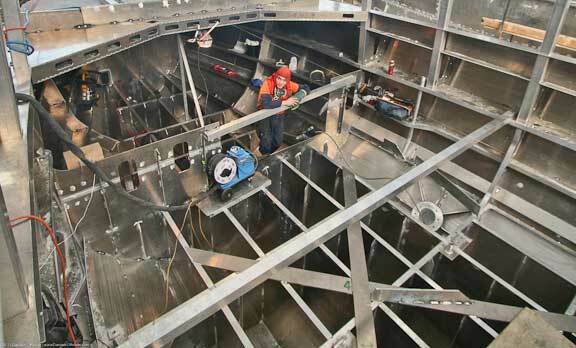 As the components for FPB 64 hulls 5, 6 and 7 come together this area will begin to fill. And, there is room to expand. FInally, one of the Kiwi “chippies” (carpenters). Having built in many parts of the world we can tell you from experience they are the best. This entry was posted on Saturday, October 1st, 2011 at 12:12 am and is filed under FPB 64 Updates. Both comments and pings are currently closed. WHat is your build time for one of these boats Steve? 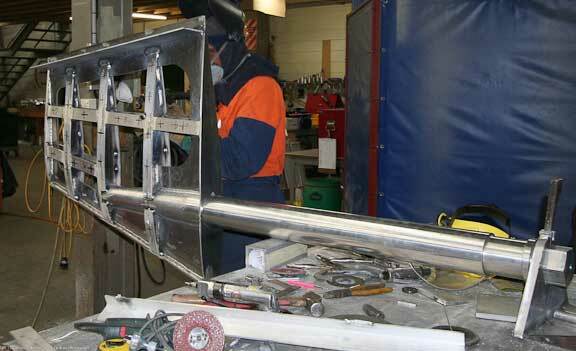 Build time is 15 to 18 months once Circa start cutting metal. Todd Rickard (ToddR@Setsail.com) can fill you in on the start date for the next available slot). The engine room bulkhead isolation looks like an interesting detail. Does the ply-rubber sandwich come pre made or do Circa construct it? Are all the layers just bonded together (and what material is used)? 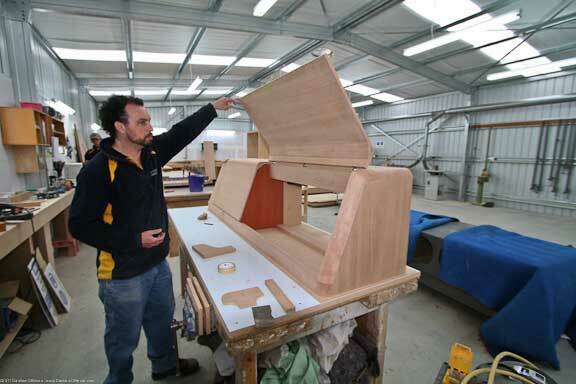 That plywood is a specially made commercial product, the details of which we prefer to keep quiet (pun intended).